BYZANTINE EMPIRE. Maurice Tiberius. 582-602 AD. Æ Follis. PCW-B855-BYZANTINE EMPIRE. Maurice Tiberius. 582-602 AD. 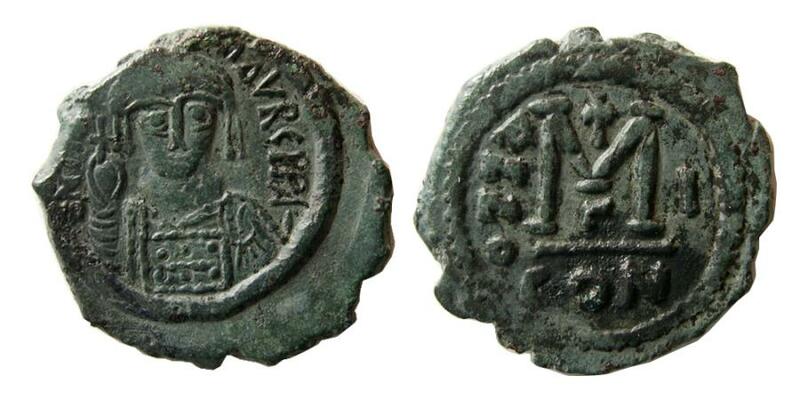 Æ Follis (10.80 gm; 30 mm). RY 1 (582/3 AD.). DN MAVRC - TIbER P P, Helmeted cuirassed bust facing, holding globus cruciger and shield / Large M, cross above, ANNO to left, regnal year I to right, Γ below, CON in exergue. SB 494. Well struck on a nice full flan. Nice dark original green patina. Choice EF. BYZANTINE EMPIRE. Isaac II Angelus. 1185-1195 AD. Æ Tetrateron. BYZANTINE EMPIRE. Heraclius. 610-641. Æ follis. Nicomedia RY 1 or 2. Overstruck on an earlier follis.